Nigel De Jong's Xabi Alonso Kick: Will Netherlands Midfielder Repeat 2010 World Cup Transgression? Nigel De Jong Kick: Will Netherlands Midfielder Repeat 2010 World Cup Transgression? Netherlands midfielder Nigel de Jong is no stranger to controversy. The 29-year-old AC Milan defensive midfielder most famously gave Spanish player Xabi Alonso a kung-fu kick to the chest in the 2010 World Cup final. 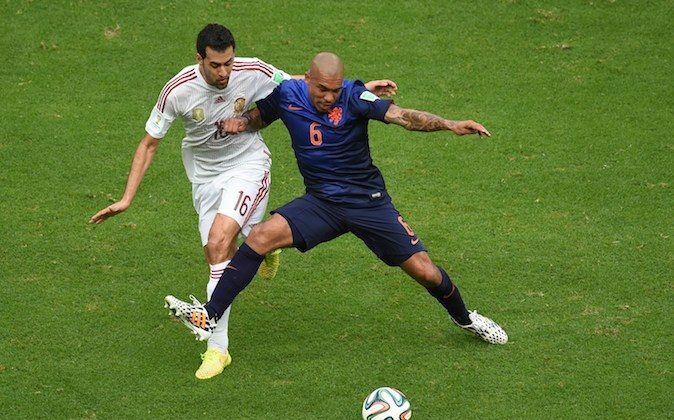 Although de Jong has insisted that he will not repeat the incident, he did give a vicious elbow to Sergio Busquets when the two sides met in the 2014 World Cup group stage. Netherlands ran out the match 5-1 winners, avenging their 0-1 lost to Spain in the 2010 World Cup finals. De Jong has since cautioned his team-mates about letting their win over Spain go to their head. “I understand that the euphoria is very large after the 5-1 against Spain,” said the AC Milan man in a press conference. “But we have to give everything against Australia. [Sunday] was actually a recovery training session because the 48 hours after a game is often the hardest. “But it is only a group match. We have achieved nothing yet. As of yesterday, we are going to focus on the game against Australia,” de Jong added. One certainly hopes that de Jong is not only just beginning in the World Cup with his tough fouls. Here is an AP article about the Netherlands and Australia.